James Bentley "Cy" Seymour was born on December 9, 1872 in Albany, New York. 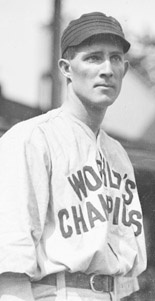 He earned the name Cy after being compared with the great Cy Young, already a star at the time. His baseball career began as a pitcher for the New York Giants way back in 1896. He would pitch for five seasons, going 18-14 in 1987, followed by a 25 in season (25-19) leading the league in walks for three straight seasons, including a whopping 213 in 1898. 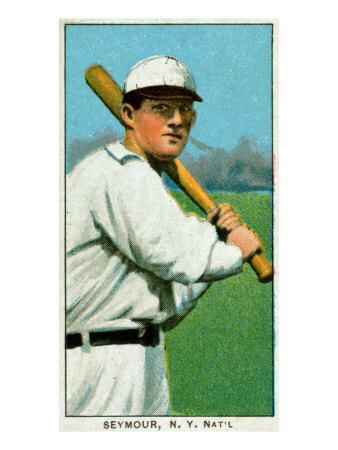 He also led the league in hit by pitches & wild pitches in 1898 as well as strikeouts for the second straight year. In his career he was 61-56, the only other player in history to have more hits & wins combined in Babe Ruth. Seymour was an even better hitter, batting over .300 ten times in his 16 year career. In 1901 he left the Giants jumping over to Baltimore in the newly formed American League. There he played under manager John McGraw for the first time building a strong relationship. In 1902 he set a record which has been tied but never beaten, getting four sacrifice hits in one game. After two seasons he went to Cincinnati to play for five seasons, having an incredible 1905 season. He led the league in hitting (.377) hits (219) doubles (40) triples (21) RBIs (121) & slugging (.559). In 1906 his contract was bought for $12,000 by the New York Giants. He rejoined the Giants after they won the 1905 World Series & played his last season in 1910 one year before they went to another World Series. Although he missed the Championship years he played centerfield on some classic John McGraw NY Giants teams, featuring Christy Mathewson, Rube Marquard, Iron Joe McGinnity, Hooks Wiltse, Turkey Mike Donlin, Larry Doyle & Roger Bresnahan. In 1906 he hit .320 in New York as the Giants finished second to the Cubs in a one game playoff. In 1907 he hit .294 with 75 RBIs 25 doubles & 8 triples. His career began to wind down, in 1909 he batted .311 in 80 games retiring the following season. He finished a 16 year career, with 1724 hits 52 HRs 229 doubles 96 triples 799 RBIs & a .303 batting average. During World War I he worked in ship yards & contracted tuberculosis. Sadly in 1919, he passed away from the disease at age 46.